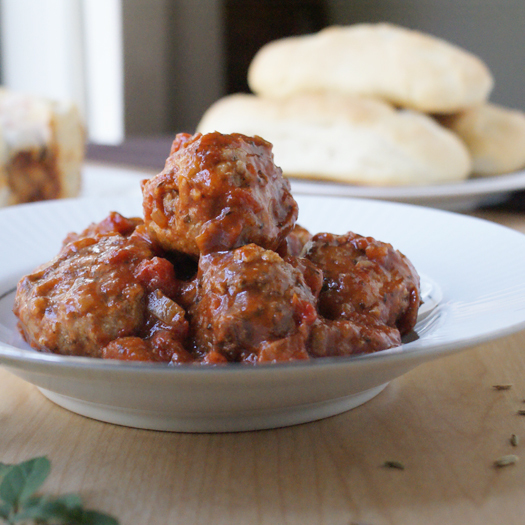 Crock Pot Herbed Turkey Meatballs are super moist and healthy meatballs made with ground turkey, fresh herbs and ricotta cheese that are slow-cooked in the crock pot with a red wine laced chunky tomato sauce. So, I'd been trying to think of ways to transform the turkey into meals my husband will eat. He's not so sure about the whole turkey deal. I wanted to make turkey burgers, but that was a no-go. He wanted beef. I had already made turkey chili recently, which I can get away with with minimal complaints, so that was out. I saw a turkey meatball recipe on Pinterest, and that's when inspiration struck. I added some fresh herbs for flavor, some ricotta to keep them moist, and some fennel seeds to make them really special. Then, I decided to cook them in the crock pot with a red wine laced chunky tomato sauce. So delicious. I still wasn't sure my husband was going to go for them, though. So I went ahead and made those meatballs into meatball subs. Man code says you gotta love meatball subs if you're a guy, right? It worked. He ate them and my daughter digged 'em, too. I did, however, get this response as he left the dinner table, "That was good. And by good, I mean I don't love turkey." Not sure what to make of that one! Haha! I LOVED them, he ate them. Good enough for me! In a medium saucepan, combine the diced tomatoes, tomato sauce, dried seasonings, 1 tbsp of the olive oil, red wine, salt and pepper. Simmer for 10 minutes. Set aside. In a large, dry non-stick frying pan, toast the fennel seeds over medium heat for 2 minutes, shaking the pan frequently. In a large bowl, combine the seeds and remaining ingredients and mix well. Roll the meat mixture into 16-20 meatballs. Heat the remaining tbsp of olive oil in the pan and brown the meatballs on all sides over medium high heat. Be gentle when flipping them so they don't break apart! Add half of the sauce to the bottom of the crock pot. 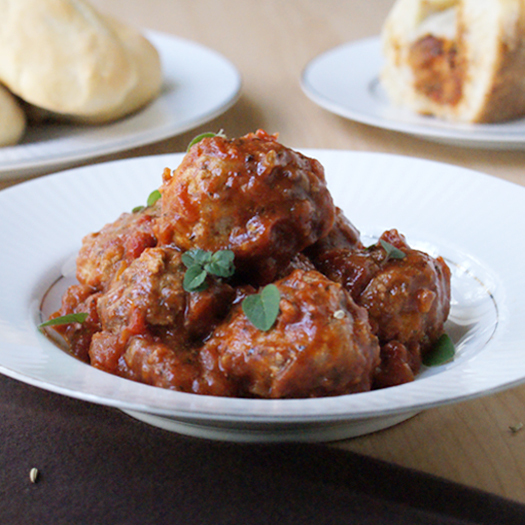 Place the meatballs in a single layer in the sauce. Top with the remaining sauce. Cover and cook on low for 4½ hours. Serve with pasta or on Hoagie Rolls toasted in the oven with mozzarella on top! Shared on Thursday's Treasures over at Recipes For My Boys. This is such a great, healthy alternative! I included it in my round-up of crock-pot recipes!